In 1999, during some downtime at a trade show, several of us took a few of the spheres that were displayed in bowls and tried balancing them on bangle bracelets. Across the aisle from our show space was a water fountain which worked perfectly for filling the spheres with water. We added a flower to each sphere and “voila!” a fabulous new bud vase happened. We have since modified the bangle bracelet to become our 1 3/4″ ring. We have sold tens of thousands of these rings over the years. 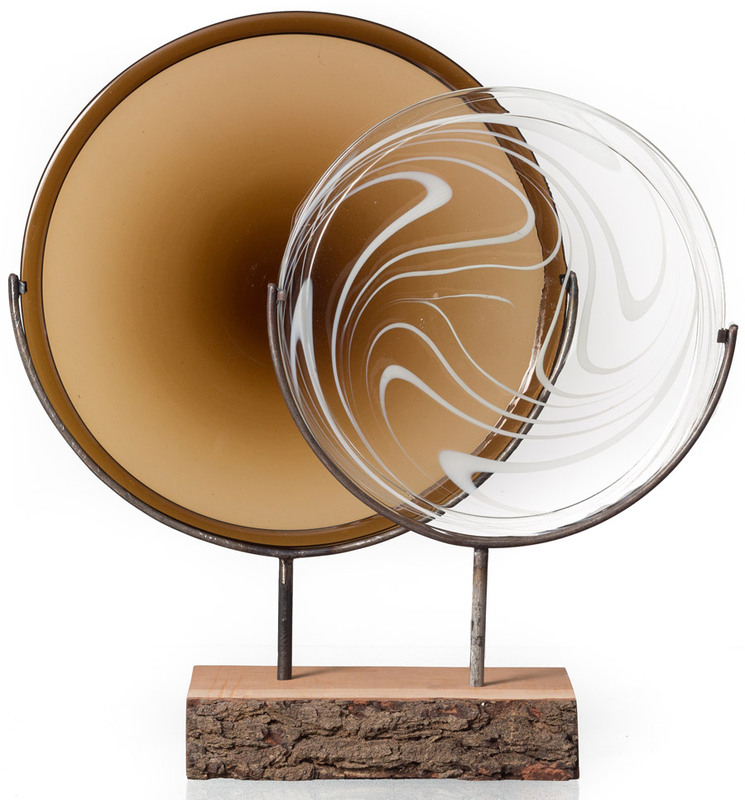 They are perfect for holding any sphere 3″ to 8″ in diameter. 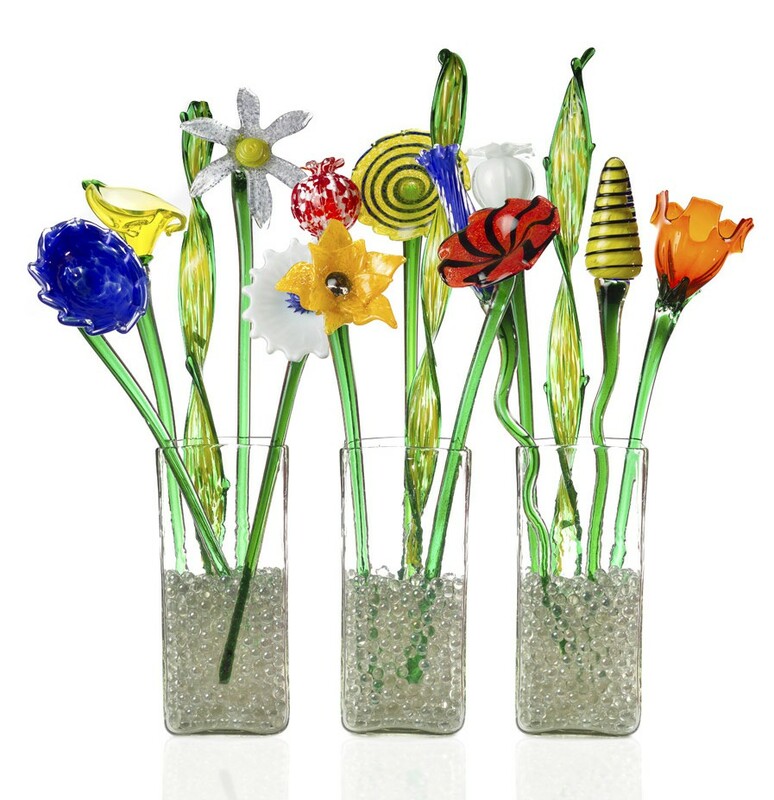 Worldly Goods Inc. specializes in hand crafted blown glass gifts and accessories for the home and garden. All our pieces are individually handmade by craftsmen using inherited skills who take great pride in their production. 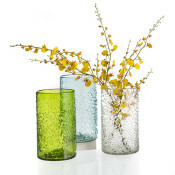 Because our products are hand crafted, every piece made has unique ripples and optical distortions as well as color and size variations that are a valued integral part of the glassware. Glass blowing is an age old technique practiced by master craftsmen. 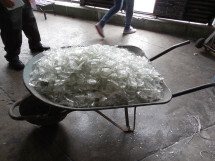 Our process begins with recycled glass pieces that generally come from tequila bottles, Coca-Cola® bottles and beer bottles. Beer bottles are where we get much of our amber coloring while our clear glass comes from tequila and Coca-Cola® bottles. 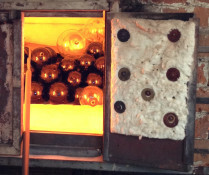 Glassblowing involves three furnaces. The first, which contains a crucible of molten glass, is simply referred to as the furnace. The second is called the glory hole, and is used to reheat a piece in between steps of working with it. The final furnace is called the lehr or annealer, and is used to slowly cool the glass, over a period of a few hours to a few days, depending on the size of the pieces. This keeps the glass from cracking or shattering due to thermal stress. The main tool of an artisan glass blower is his blowpipe, a steel or iron rod usually about 4ft. in length. 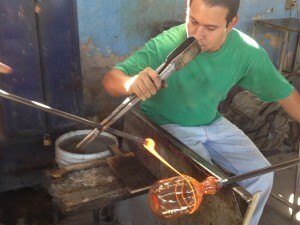 The tip of the blowpipe is first preheated; then dipped in the molten glass in the furnace. The molten glass is “gathered” onto the end of the blowpipe in much the same way that viscous honey is picked up on a honey dipper. This glass is then rolled on the marver, which was traditionally a flat slab of marble, but today is more commonly a fairly thick flat sheet of steel. This process, called marvering, forms a cool skin on the exterior of the molten glass blob, and shapes it. Then, air is blown into the pipe, creating a bubble. Next, the molten glass is attached to another stainless steel or iron rod called a punty for shaping and transferring the hollow piece from the blowpipe to provide an opening and/or to finalize the top. The glass can be blown into a mold to make more uniform products or can be blown free form to create art pieces like our deco bowl or leaves. 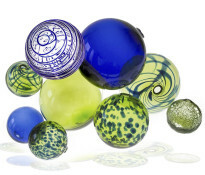 There are many ways to apply patterns and color to blown glass, including rolling molten glass in powdered color or larger pieces of colored glass called frit. After the glass is made, it can be mirrored or plated by adding a chemical solution of silver nitrate and ammonia to the inside of the glass. 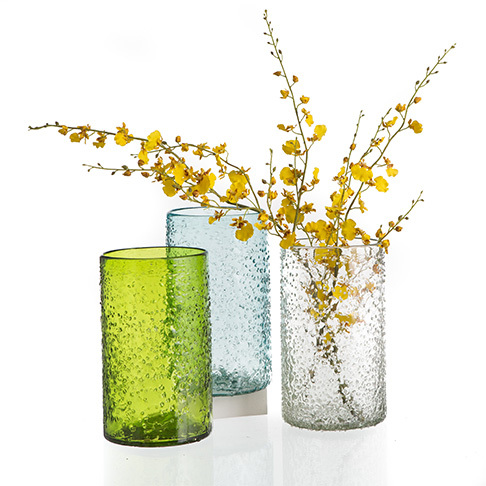 At Worldly Goods Inc, we design all our products and every piece we offer is individually hand-crafted for impeccable quality All our products are mouth blown and made from recycled glass. They vary somewhat in size, shape, and color which is the normal and charming characteristic of artisan workmanship. 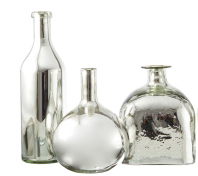 Shimmering, bottles, spheres, candle holders, and bowls all coated inside with silver nitrate to make them mirrored. 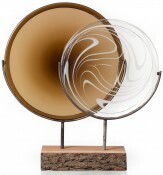 From 8” to 14” in diameter in a large assortment of colors and patterns. Available as a single for the garden or in one of our Natural Wood Bases. 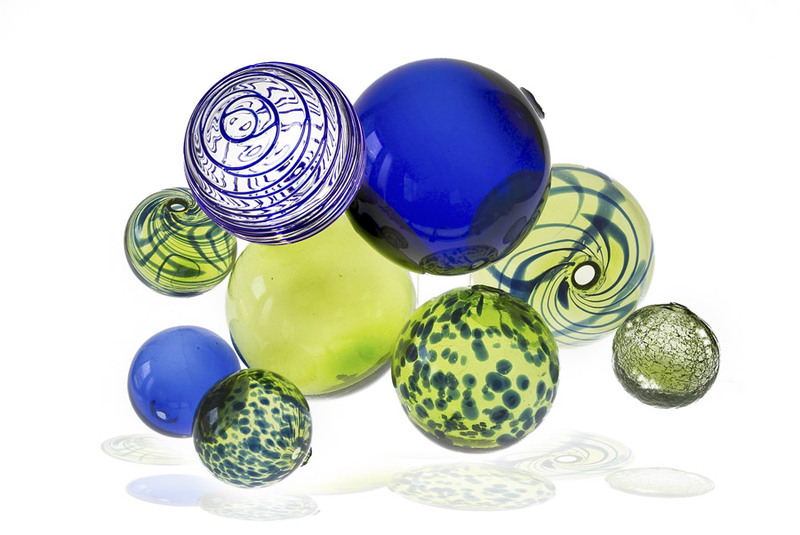 Spheres in a multitude of sizes and colors with contrasting swirls, spots and threads. From 5” tall to 16” tall and wall mountable. In many shapes, textures, and patterns. Handmade, fused glass flowers and leaves in brilliant colors.